A Land Launch Zenit 3SLB rocket launches the new Telstar 11N satellite into orbit from Baikonur Cosmodrome, Kazakhstan on Feb. 26, 2009. This story was updated onFeb. 27 at 8:47 a.m. EST. A Zenit rocket blasted offfrom Kazakhstan Thursday and deployed a Canadian communications satellitedesigned to bridge three continents with Internet and video services. The Zenit 3SLB boosterlaunched at 1830 GMT (1:30 p.m. EST) Thursday from pad 45 at the BaikonurCosmodrome in Kazakhstan, beginning the second mission of a Sea Launch spinoffprogram aimed serving the market for medium-class communications satellites. Propelled by a four-nozzleRD-171 engine, the 192-foot-tall launcher darted into the night sky and flew toan altitude of 52 miles before jettisoning the first stage about two-and-a-halfminutes after liftoff. The Zenit's second stageignited for a six-minute firing, during which the rocket shed its nose coneafter it transited the dense lower layers of the atmosphere. The Block DM-SLB upperstage continued the push toward orbit moments after separating from the secondstage. The kerosene-fueled stage first placed the rocket and the Telstar 11Nsatellite into a temporary low-altitude parking orbit, then gradually raisedthe craft's altitude and lowered its inclination. The upper stage releasedthe 8,840-pound satellite a few seconds before 0026 GMT Friday (7:26 p.m. ESTThursday), completing the Land Launch consortium's second missionsincebeginning services in April 2008. A ground station inAustralia acquired radio signals from Telstar 11N a few minutes later,confirming the craft survived the trip to space. Thursday's flight was thefirst Land Launch mission under the auspices of Sea Launch. Lastyear's debut launch was managed by Space International Services Ltd., SeaLaunch's Moscow-based partner in charge of mission integration. The maiden flight washampered by an undisclosed technical issue that caused the mission's Israelisatellite payload to be deployed in an orbit just shy of prelaunch predictions. No such problems appearedto occur Thursday, and Sea Launch officials declared the flight a total successshortly after spacecraft separation. "This significantaccomplishment represents the work of Space International Services, based inMoscow, and its collaboration with the Sea Launch partnership," said KjellKarlsen, president and general manager of Sea Launch. "Our Land Launchservice responds to our customers' requirements for reliable, single-payloadcapabilities in the medium-weight commercial satellite market." The Zenit was shooting fora geosynchronous transfer orbit with a high point of 22,236 miles, a low pointof 954 miles and an inclination of 34.6 degrees. Telstar 11N will use itsown propulsion system to reach a circular geosynchronous orbit with an altitudeof about 22,300 miles. The satellite will be stationed over the equator at 37.5degrees west longitude, or just off the northeast coast of South America. The satellite carries 39Ku-band transponders able to reach customers in North America, Western Europeand Africa. Telstar 11N also includes an Atlantic Ocean beam to provide mobilebroadband services to ships and airplanes on transoceanic routes. Space Systems/Loral builtthe spacecraft for Ottawa-based Telesat, a partially-owned subsidiary of LoralSpace and Communications Inc. Telesat is a leading operator of 13 satellitescovering six continents. Telstar 11N is based on the Loral 1300 series of communicationssatellites. Telstar 11N is designed tooperate for at least 15 years. "We thank Sea Launchand Space International Services, their Land Launch partner, for theirdedication in providing a successful mission and we also thank Space Systems/Loral,"said Dan Goldberg, Telesat president and CEO. 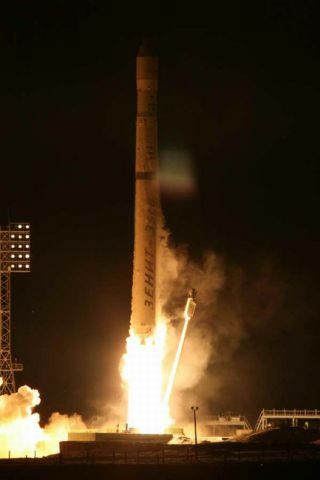 "This is Telesat'sfirst time using the Zenit 3SLB vehicle at the Baikonur space center and we areobviously very pleased with the outcome today," Goldberg said. Two more Land Launchmissions are on tap for the rest of the year. Sea Launch also plans threeflights from the company's oceangoing Odyssey launch platform. The Telstar 11N missionleapfrogged another Land Launch flight with the Malaysian MEASAT 3acommunications satellite. MEASAT 3a was damaged during a crane mishap atBaikonur last August, and officials decided to ship the satellite back to itsbuilder in the United States for repair work. The next Sea Launch flightis slated to loft the Sicral 1B military communications satellite for Italy.That launch was delayed from this month due to unspecified technical concernswith spacecraft.